Shoulder season river cruises can provide exceptional value. Airfares are generally cheaper than they are in peak season; river cruise rates can be up to 20 percent less than they are during the height of the summer; cities and tourist attractions are generally less crowded; restaurants and cafes are often a little less busy. And the weather? You may need to bring along a sweater or a wind-breaker, and it’s not a bad idea to pack a rain jacket, but on the plus side you’ll almost always escape the heat of the summer. When is shoulder season? There are no set rules, but for the purposes of comparison, think April and May at the front end, and September, October and November on the back end. My shoulder season 2019 price comparisons should be viewed as general guidelines for comparing prices across the major companies operating on a particular river (or region) in Europe or for a particular itinerary. The intent of the charts is to provide a baseline for matching a cruise company to your budget. I’ve calculated what I believe to be the “true per diem” for each cruise company, after factoring in, or out, the various items that are included, or not included, on a particular river cruise. Pricing is anything but straightforward among the major river cruise companies, as many companies offer two-for-the-price-of-one river cruises, reduced or free air- fare incentives, early-booking discounts and many more pricing tactics that make purchasing a river cruise vacation a complex and confounding exercise. Using a spreadsheet until we were bleary-eyed, my team and I have tried to decipher the various offers and inclusions to arrive at meaningful guidelines for comparisons. The bottom line, the true per diem, is what you can expect to pay per person for each day of your cruise for a lead-in standard stateroom, or where applicable, a lead-in balcony stateroom. Price, however, should not be the only consideration when selecting a company for your river cruise. There are a boatload of variables to be considered, not the least of which is what’s included in your cruise. If you’re someone who prefers everything included, an open bar, for example, and prepaid gratuities, you’ll want to look to companies that provide those as part of your cruise fare. For help in figuring out which cruise company includes what, see “Attributes Of The Top River Cruise Companies,” a chart that outlines inclusions. All prices and inclusions were current as of May 2018. CroisiEurope’s 2019 rates were not available at press time. As always, I welcome your comments and feedback. While I try to get things right, I do goof now and then, which is why I am extremely grateful to readers who bring errors to my attention so that I can correct them as quickly as possible. And if you run into any bumps along the road (or rapids along the river) while doing your river cruise research, feel free to reach out to me using the comments form below. Current incentives when I compiled the chart in May of 2018: AmaWaterways, $750 off per person; Emerald Waterways, free air for all Horizon Deck guests; $295 for Vista Deck and $495 for Riviera Deck; Scenic, fly free; Uniworld, 10 percent off when paid in full; and Viking, two cruise for the price of one and air is offered for $499 per person. * Port Charges – Not all river cruise companies include port charges. What are port charges? Ports of call, where river cruise ships dock, set their own fees, and these fees are then passed on to the river cruise passengers. See our post on port charges, Port Charges: Which River Cruise Companies Include Them? * Gratuities (on ship) – Some companies include gratuities for crew, others leave it to their guests to take care of gratuities. If your cruise is one of the latter, you may want to have some euro notes handy for stuffing into envelopes (or into the hands of your favorite crew members) on the last night of the cruise. Guidelines of how much to tip also vary by river cruise line. See Prepaid Gratuities: Which River Cruise Companies Include Them? * Gratuities (on shore) – Just as with crew gratuities, some companies take care of on-shore gratuities for guides and drivers; other companies leave it to their guests. If you’re traveling with a company that operates by the latter policy, be sure to carry euro coins with you for tipping guides and drivers. * Beverages – Nearly all river cruise companies offer complimentary soft drinks, speciality coffees, beer and wine during lunch and dinner. In between mealtimes, though, you’ll pay for most beverages when traveling with Avalon, Emerald, Riviera and Viking. Beverages are included on CroisiEurope, Crystal, Scenic, Tauck and Uniworld. AmaWaterways introduced a “Sip and Sail” Happy Hour in 2018, which includes complimentary cocktails before dinner. 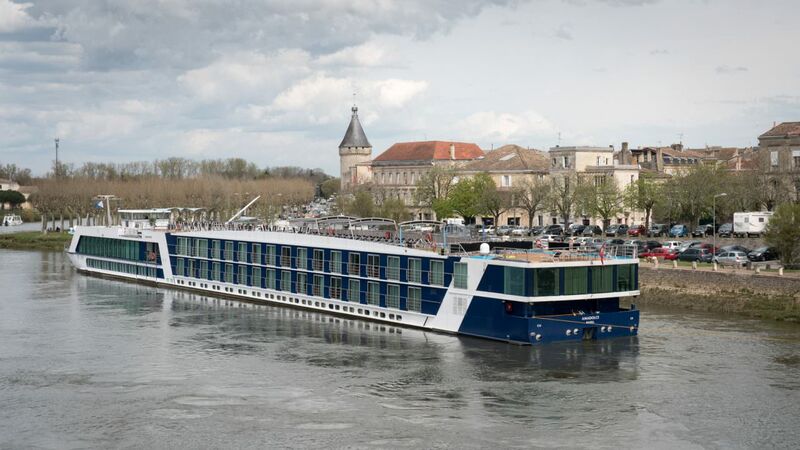 For that reason, I’ve indicated AmaWaterways as “Beverages Included,” though you should be aware that you could leave the ship with a balance on your bar tab if you consume beverages outside of Happy Hour or breakfast (sparkling wine is included), lunch or dinner. Riviera does not include wine and beer, even during lunch and dinner. For those who don’t imbibe – and who don’t wish to pay for an inclusion they won’t make use of – Riviera’s a la carte pricing structure makes a lot of sense. For those who want to add a touch of the all-inclusive to their Riviera experience, the company offers drink packages for its 2019 river cruises that start at roughly $159 per person for an average weeklong voyage. This adds draft and non-alcoholic beer, red and white house wine, bottled water, soft drinks and juices on a complimentary basis to lunches and dinners served onboard. Spirits, or drinks purchased outside mealtimes, come at an additional cost. Viking River Cruises has a similar package. While Viking includes beer and wine with lunch and dinner, the company also offers a Silver Spirit Beverage Package. At €300 per cabin, double occupancy, the cost of Viking’s all-inclusive beverage package may seem steep at first glance, but it can be quite a value when you consider the quality of the beverages offered. Are you a Scotch drinker? Then you may know of Highland Park Ragnvald, which goes for more than $500 a bottle on the internet sites I researched. Yet on Viking, you can enjoy as many glasses as you like of the single malt Scotch whiskey as part of your Silver Spirit Beverage Package. Without the package, a 4 cl shot of Ragnvald goes for €22. Now you know which one to order when you belly up to the bar on Viking. * Laundry – All-inclusive river cruise companies may provide free laundry service during your cruise. Some companies also provide access to washers and dryers free of charge and even include the soap. Most river cruise companies offer laundry and pressing services for a fee if it’s not part of an all-inclusive package. Either way, you’ll likely need to do some laundry while traveling, unless you pack like I do. See What I Pack When I river Cruise, What About You? If you don’t pack like me, you’ll need laundry services. See Laundry Services: Which Cruise Lines Include Them? * Optional Shore Excursions – All river cruise companies include complimentary excursions in most, if not all, ports of call. However, some companies offer optional shore excursions for a fee. Avalon, Crystal, Emerald, Riviera and Viking are among the companies that offer optional shore excursions. On my April 2017 Rhine cruise on Viking, for example, complimentary excursions were offered at each stop along the way. Viking also offered about a dozen optional tours, ranging in price from €49 per person to €189, the latter being a full-day excursion called Taste the Best of Alsace. Viking Hlin’s program director, Candi Finkelstein, told me that this was the number one rated tour on the Rhine Getaway itinerary, so sometimes paying for something you would not otherwise experience is not a bad thing. On Crystal’s Danube Dreams & Discoveries, more than two dozen shore excursions are offered, and most of those are complimentary. Crystal’s optional shore excursions on that itinerary range from a complimentary Culinary Walking Tour in Bratislava to Michelin-star dining experiences for $249 per person. On Emerald Waterways’ Danube Delights itinerary, you can pay extra for its DiscoverMORE excursions for such exclusive events as Tastes of Vienna and a Viennese Concert. * Current Incentive (per person) – Riviera does not offer booking incentives, CroisiEurope rarely does. The rest offer a range of incentives, ranging from early-booking savings to two-for-ones and reduced or free air. The incentives are always changing so be sure to check with your travel seller or the cruise company about current offers. * Value of Incentive (per day/pp) – I’ve divided the amount of the incentive by the number of nights to arrive at a per-diem value. Calculating the value of the incentives was a bit challenging, especially when it comes to air. One river cruise company, for example, may offer $1,399 toward air while another may offer $1,195. To level the playing field, I have used $1,399 as the baseline for economy air between North America and Europe. How does that play out? If a company is offering $1,399 toward air on a 10-day cruise that equates to an incentive of $139 per person per day. * Per Diem/Square Foot – Why provide a square-footage per-diem? Why not? The idea is to provide a guideline of how much space you’re getting for the rate you pay for your river cruise. Though I caution that you should not plan to spend heaps of time in your room. There’s too much to see and do outside of those four walls. * Balcony Upgrade – Nearly all of the entry-level staterooms feature fixed windows. The exception is Crystal, where even entry-level staterooms on its new vessels feature “Panoramic Balcony-Windows” that raise and lower, and basically function like a balcony (except on Mozart, which does have some fixed windows). CroisiEurope does not offer balconies on the majority of its vessels, but it too has windows that open, and though not as elaborate as those on Crystal, CroisiEurope’s windows provide fresh air and river views. With other cruise companies, you may want to upgrade to a balcony stateroom. I’ve provided price differentials for upgrades to entry-level balcony staterooms. Note that some of the entry-level balcony staterooms may be smaller than entry-level fixed window staterooms.